NO BACKING JUST THE ZEGNA CLOTH TO REPAIR FRONT SEATS OR TO GO ON THE DOOR. This is for the Drivers side door. This will not fit the convertible. This part was removed from a9-3 2005 Convertible. You are looking at aSAAB 9-3 Right Hand Rear Door Card Beige Panel. Your 3 digit Saab body colour code can be found in your glovebox OR on the inside of one your front doors. SAAB CLASSIC 900 3CK/2SN LEFT DOOR CARD TRIM - LIGHT GREY. To suit SAAB Classic 3CK/2SN 1986 to 1993 model years. SAAB part numbers are . I have up for sale a used genuine lefthand door card trim finished in Light Grey. If this is not the case then you have the choice of refusing the item whilst you are on site. Before we dismantle parts from a car, we check the functionality to ensure that the parts are in good working order. THIS PART IS FROM A 2007 SAAB 9-3 FACELIFT 1.9 DTH, 6 SPEED MANUAL, 5 DOOR ESTATE. Any item or invoice marked 'Sold as Seen' will invalidate this warranty. Engines are sold complete less ancillaries and when replaced must be fitted with new timing belt, auxiliary belts, oil, filters and spark plugs. SAAB 9-3 (9440) CONVERTIBLE LEFT DOOR CARD TRIM - K20 GREY/268 SILVER (PART NO: 12774580). To suit SAAB 9-3 (9440) Convertible 2004 to 2012 model years. I have for sale a used left hand front door card trim. SAAB 9-3 (9440) CONVERTIBLE RIGHT REAR QUARTER TRIM - K20 GREY/268 SILVER (PART NO: 12774706). To suit SAAB 9-3 (9440) Convertible 2004 to 2012 model years. I have for sale a used right hand rear interior quarter front trim. Mk2 1.9 Diesel 6 Speed Manual 4 Door Saloon. This part was removed from a Right Hand Drive Vehicle. Compatibility is a guide only. Your item will need to be signed for. Door Panel. TRIM LEVEL. Part Number. SAAB NG 900/9-3 (9400) FRONT DOOR CARD SPEAKER GRILLE - GREY (PART NO: 4772577). SAAB 9-3 (9400) 1998 to 2003 model years. SAAB NG 900 1994 to 1998 model years. SAAB part number is 4772577. Collection from Suffolk (IP6) can also be arranged. This part was removed from a9-3 2005 Convertible. You are looking at aSAAB 9-3 Left Hand Rear Door Card Beige Panel. Your 3 digit Saab body colour code can be found in your glovebox OR on the inside of one your front doors. SAAB 9-3 (9440) CONVERTIBLE LEFT REAR QUARTER TRIM - K20 GREY/268 SILVER (PART NO: 12774705). To suit SAAB 9-3 (9440) Convertible 2004 to 2012 model years. I have for sale a used left hand rear interior quarter front trim. Mk2 1.9 Diesel 6 Spd Saloon. This part was removed from a Right Hand Drive Vehicle. Compatibility is a guide only. Your item will need to be signed for. Door Panel. TRIM LEVEL. Part Number. SAAB 9-3 (9400) CONVERTIBLE RIGHT REAR TONNEAU FLAP TRIM - LIGHT GREY (PART NO: 5110283). I have up for sale a used genuine right hand rear tonneau flap trim. Finished in Light Grey. To suit SAAB 9-3 (9440) Convertible 1998 to 2003 model years. AERO DOOR CARD (Cream with Black Trim). SAAB 2004-2010. You are looking at aSAAB 9-3 Left Hand Front Door Card (Convertible). This part was removed from a9-3 2006 Convertible. Convertible ONLY. Your 3 digit Saab body colour code can be found in your glovebox OR on the inside of one your front doors. THIS PART IS FROM A 2007 SAAB 9-3 FACELIFT 1.9 DTH, 6 SPEED MANUAL, 5 DOOR ESTATE. Land Rover. Any item or invoice marked 'Sold as Seen' will invalidate this warranty. Engines are sold complete less ancillaries and when replaced must be fitted with new timing belt, auxiliary belts, oil, filters and spark plugs. Vector 1.9 Diesel Auto Saloon. L Rear Door. Trim Level Other Details Number Of Doors. To suit SAAB 9-3 (9440) Convertible 2004 to 2012 model years. SAAB part numbers are 12830781 and 12830480. Supplied as a left and right hand pair. In used but very good clean condition. Collection from Suffolk (IP6) can also be arranged. SAAB 2004 - 2010. You are looking at aSAAB 9-3 Left Hand Front Door Card (Convertible). DOOR CARD (Grey in colour). This part was removed from a9-3 2005 Convertible. Convertible ONLY. Your 3 digit Saab body colour code can be found in your glovebox OR on the inside of one your front doors. THIS PART IS FROM A 2007 SAAB 9-3 FACELIFT 1.9 DTH, 6 SPEED MANUAL, 5 DOOR ESTATE. Land Rover. OUR REF: REF 00000381. THIS IS A BARE DOOR CARD. Any item or invoice marked 'Sold as Seen' will invalidate this warranty. This part was removed from a9-3 2005 Convertible. You are looking at aSAAB 9-3 Left Hand Front Door Card Beige Panel. Your 3 digit Saab body colour code can be found in your glovebox OR on the inside of one your front doors. SAAB 93 9-3 MK2. OUR REF : 034. FRONT DOOR CARD & DOOR HANDLE (BEIGE). Opening Hours 8.00 am - 5.00 pm. THE PARTS COMPATIBILITY TABLE IS ONLY A GUIDE. FRONT RIGHT - DRIVERS SIDE - O/S. "This is a used part and will show signs of wear but it is in good working condition.”. SAAB 900 (1978-1994). O/S Driver Right Rear. Changed your mind?. 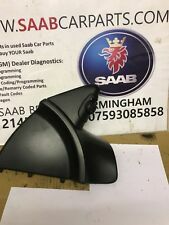 New Genuine Saab 9-3 Rear Right Hand. Saab Part Number:12790767. Interior Door Handle. Saab 9-3 Sedan / Saloon 2006 model rear left door card in good used condition. SAAB 93 9-3 MK2 (SPORTWAGON). FOR SAAB 93 ESTATE / WAGON (DOES NOT HAVE BOOT OPEN SWITCH HOLE ON THE DOOR CARD. OUR REF : 033. FRONT DOOR CARD & DOOR HANDLE (BEIGE). Opening Hours 8.00 am - 5.00 pm. THE PARTS COMPATIBILITY TABLE IS ONLY A GUIDE. ). SAAB NG 900 & 9-3 (9400) 5 DOOR HATCHBACK LEFT REAR DOOR EXTERIOR TRIM COVER (PART NO: 5333174). SAAB part number is 5333174. SAAB NG 900 5 door Hatchback 1994 to 1998 model years. SAAB 9-3 (9400) 5 door Hatchback 1998 to 2003 model years. SAAB 9-3 (9400) CONVERTIBLE LEFT REAR TONNEAU COVER DRIVE UNIT CABLE (PART NO: 4851994). To suit SAAB 9-3 (9440) Convertible 1998 to 2003 model years. I have up for sale a used genuine left hand rear tonneau cover drive unit cable. SAAB 900 3 Door (1993-1998). N/S Passenger Left. Front Door Card. Changed your mind?. THIS PART IS FROM A 2007 SAAB 9-3 1.9 DTH, 6 SPEED AUTOMATIC, 5 DOOR SALOON. Land Rover. OUR REF: REF 00000356. Any item or invoice marked 'Sold as Seen' will invalidate this warranty. Engines are sold complete less ancillaries and when replaced must be fitted with new timing belt, auxiliary belts, oil, filters and spark plugs. SAAB NG 900 HATCHBACK RIGHT FRONT DOOR TRIM COVER (PART NO: 4215364). SAAB part number is 4215364. SAAB NG 900 3 door Hatchback 1994 to 1998 model years. SAAB NG 900 5 door Hatchback 1994 to 1998 model years. SAAB 9-5 (9600) INTERIOR DOOR CARD GRAB HANDLE TORX SCREW COVERS - BEIGE (PART NO'S: 4644381/4644399). I have up for sale a used genuine set of two interior door card grab handle torx screw covers finished in beige. THIS PART IS FROM A 2004 SAAB 95 MK1 2.0 PETROL, 5 DOOR ESTATE, 5 SPEED AUTOMATIC. Land Rover. OUR REF: REF 00000185. THIS DOOR CARD HAS A FEW SMALL SCRATCHES. Any item or invoice marked 'Sold as Seen' will invalidate this warranty. R Front Door. TRIM LEVEL. Other Details. MK2 VECTOR SPORT TID. SAAB 9-3 (9440) LEFT FRONT DOOR MIRROR INTERIOR TRIM COVER (PART NO: 12794344). SAAB part number is 12794344. SAAB 9-3 (9440) 4 door Saloon 2003 to 2012 model years. I have up for sale a used genuine left hand front door card mirror switch housing trim cover. SAAB 900 3 Door (1993-1998). Changed your mind?. Front Door Card. O/S Driver Right. THIS SALE IS FOR THE OFFSIDE REAR BARE DOOR CARD PANEL ONLY. 2005 SAAB 9-3 VECTOR SPORT 1.9 TID SALOON. FITTED TO A 2005 SAAB 9-3 VECTOR SPORT TID 4 DOOR WITH A 1.9 DIESEL ENGINE WITH A 6 SPEED MANUAL GEARBOX. SAAB 9-3 (9400) CONVERTIBLE RIGHT REAR TONNEAU COVER DRIVE UNIT CABLE (PART NO: 4852200). To suit SAAB 9-3 (9440) Convertible 1998 to 2003 model years. I have up for sale a used genuine right hand rear tonneau cover drive unit cable. Land Rover. THIS PART IS FROM A 2004 SAAB 95 MK1 2.0 PETROL, 5 DOOR ESTATE, 5 SPEED AUTOMATIC. OUR REF: REF 00000185. Any item or invoice marked 'Sold as Seen' will invalidate this warranty. Engines are sold complete less ancillaries and when replaced must be fitted with new timing belt, auxiliary belts, oil, filters and spark plugs. SAAB NG 900 & 9-3 (9400) CONVERTIBLE LEFT REAR TONNEAU LOCK (PART NO: 5184650). SAAB part number is 5184650. SAAB NG 900 Convertible 1994 to 1998 model years. SAAB 9-3 (9400) Convertible 1998 to 2003 model years. Saab 900 (1993-1998). N/S Passenger Left. Changed your mind?. Drivers side - this is the right hand side of the car. Passenger side - this is the left hand side of the car. NS = Near Side (Left) OS = Off Side(Right). LH = Left Hand RH = Right Hand. RHD = Right Hand Drive LHD = Left Hand Drive. (SAAB 9-5 (9600) INTERIOR DOOR CARD GRAB HANDLE TORX SCREW COVERS - GREY PART NO'S: 4644365/4644373). I have up for sale a used genuine set of two interior door card grab handle torx screw covers finished in grey. Front nearside door card for Saab 9-3 convertible. Classic radio also available.